Honestly, Jump Force always looked rough from the first trailer. History also wasn’t on Bandai Namco‘s side either. Even 3D Dragon Ball Z games have suffered, and the Naruto ones, (which Jump Force takes a lot from,) aren’t much better. The inherent problem, at least with a DBZ fighting game, is that flying around is at odds with the camera, usually making for a completely terrible experience. 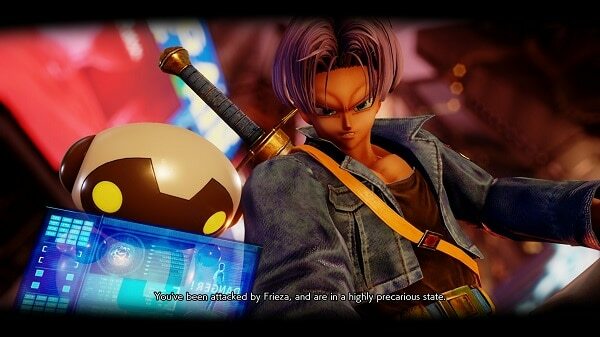 To its credit, Jump Force does side-step this particular issue, and has some good fighting mechanics. However, almost everything else surrounding the actual fighting is baffling. Your character in the game is basically a blank slate. 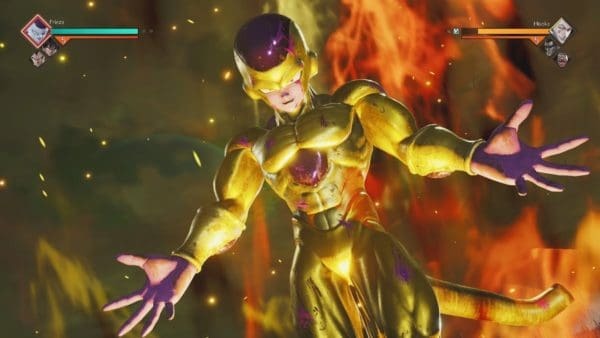 The story has you playing a regular human who gets blasted by Frieza. You then get resurrected with an Umbra’s Cube, which also gives you super powers. 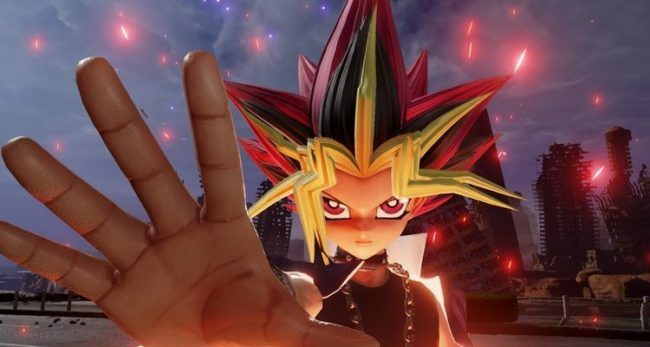 After that, you join the Jump Force, which is a sort of inter-dimensional police agency encharged with stopping the bad guys from using evil Umbra’s Cubes to infect people and destroy everything. What this really means is that the game is giving you somewhat free reign in how you want to make your character. If you want to give him or her all of Monkey D. Luffy‘s special moves that he uses in One Piece, you can. Albeit you do have to purchase some of them from the store. 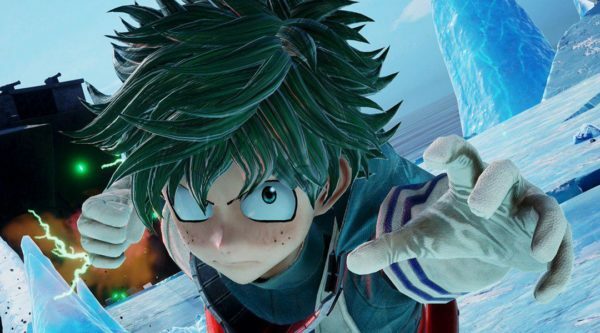 Jump Force allows you to customize three special attacks and your Awakened move. 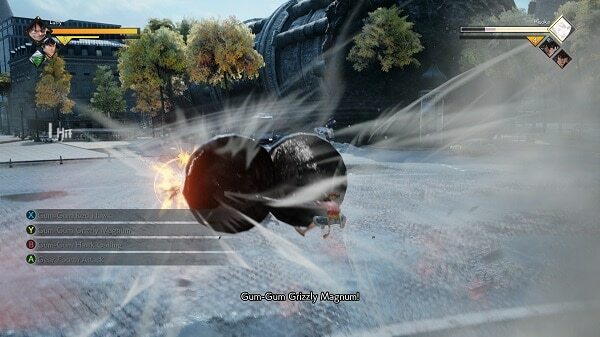 While the rest of your moves depend on the fighting style you choose for the character. This customization also goes for your character’s attire as well. There are a LOT of clothes and accessories available for your character. Either general items or franchise-specific stuff. Although once again, you have to purchase most of it through in-game earned money. There are two really weird quirks with the story, which are a bit annoying. 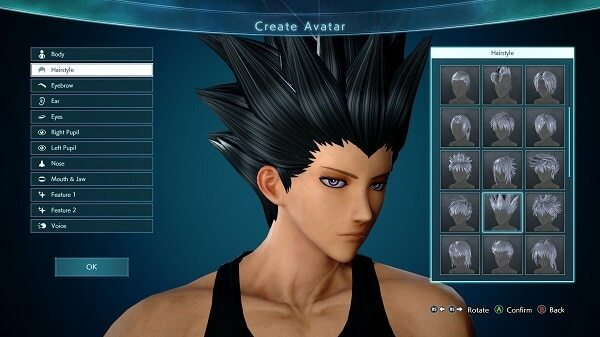 First, at the start of the game you are told to pick a Jump Force team: Alpha, Beta or Gamma. Alpha is about defending territory from the bad guys. Beta attacks the evil group (Venoms), and Gamma gathers info and is generally stealthy. Each group is headed by a captain. Alpha (Goku), Beta (Luffy), Gamma (Naruto). You are told this is an important decision that cannot be changed once you make it and it has repercussions for the story. This is all just a big hill of beans. While it does alter what special moves you start with, that’s about it. There are quite a number of story beats that require you to talk to each team member to actually progress through the story. In fact, about a few missions into the story, the commander tells you to not worry about the team concept and just band together to save the universe. So, although there might be some variations on the missions, the end goal winds up the same. Also, each team has their own separate smaller hub area which is separate from the even larger main hub area. This leads into the other story quirk. The hub world is where you do everything in the game. buy stuff, take on side missions, and it is also a social space for you and other players if you want to play online. However, the hub world just winds up being one massively huge annoyance. Although It doesn’t seem so big at first glance, it is really just a main room with three team wings and a fourth underground wing where you meet the commander for missions. 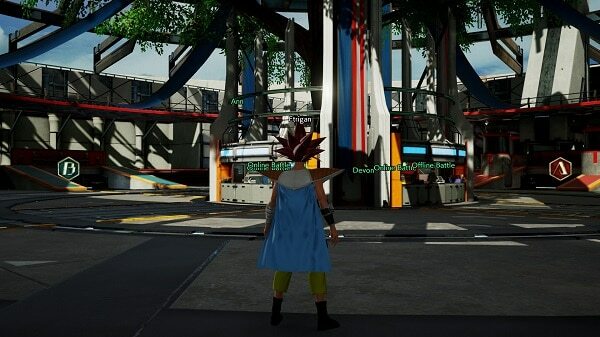 It is honestly a giant pain to get around in Jump Force. You even have vehicles to help you get around, a bike, a frog (don’t ask), a boat, and a Frieza chair (if you pre-ordered the game), and even this stuff is too slow. After the intro sequence, I literally spent 20 minutes roaming the empty halls (this was before launch) of the hub world because I couldn’t figure out how to start the next story sequence. There’s no mini-map at all, just a rudimentary chat window. An icon eventually appears once you pick the correct wing to go down, but how the hell am I supposed to know where it is? The team wings all have the same things. A mission booth, a store, and ability kiosks. You can talk to a few of your teammates but they have almost nothing to say. 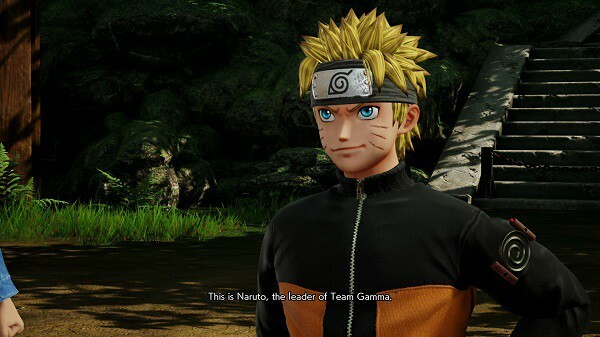 nine times out of 10, to start the next story mission you have to talk to the Jump Force commander, and not the supposed super important team captain. 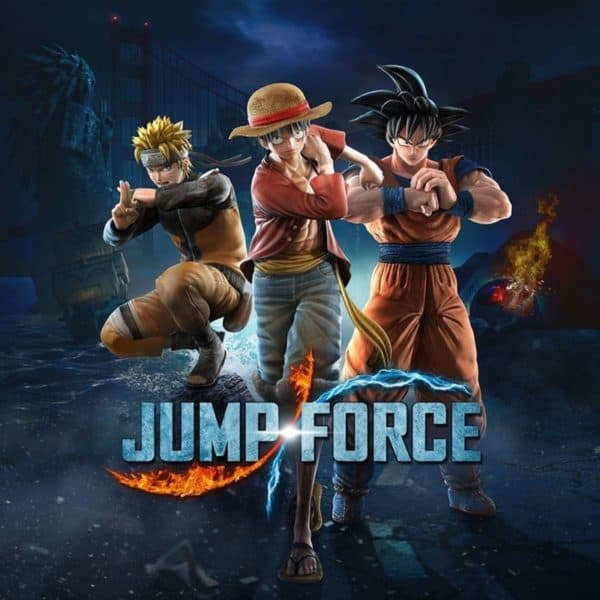 To start with, Jump Force brings together over 40 characters from various Shonen Jump Manga. This includes major characters from Dragon Ball Z, Naruto, One Piece, Bleach, to lesser known ones (for me anyway), like City Hunter, Black Clover, and others. Some franchises, like Yu Yu Hakusho only have one or two characters, while DBZ and One Piece top out with six characters each. So, if you are into any reasonably big Shonen Jump franchise, you’ll likely find someone in here that you resonate with. Overall though, the characters just look weird to put it midly. While the animation is certainly rough, the plastic sheen some characters have is really off-putting. They should have just done what Smash Bros does and say “This is all in a toy box and the characters are dolls”. That would have helped a lot. Instead of going with this super realistic art design that just makes a lot of characters look super creepy instead. The controls are somewhat simple but that is because the fighting engine isn’t too complex. X and Y are used for light and heavy attacks. A is used to jump and B is the throw/grab button. LT is used as the tag in button, RT is used for charging up your power/doing special attacks. Finally, LB is used for dashing around while RB is used for guarding. Pressing the right analog stick in, when your “Awakening Gauge” is active also lets you enter in the Awakening Mode, which I’ll get into down below. There are a few things to break down when it comes to the controls. First, there isn’t any flying at all. Characters can jump but they don’t zip around the stage while the camera tries (and fails) to follow them, so that is nice. Second, when you hold RT you do power up but it is THE only way to do special attacks. When holding RT, the face buttons become your special move buttons, X is usually used for a beam attack, Y is a melee attack and B is something of a utility attack. Although it depends on the character. This isn’t a rule for every character but just kind of a general guideline. The A button is your super move and can only be used when you’re in the Awakened State. Awakened State is a powered-up form you can activate once you’ve taken a certain amount of damage. You become a bit faster and stronger but really you want to use it to do your super move. This move is pretty analogous to the X-Ray move from the recent Mortal Kombat games. This is the big, flashy, (generally) character specific move, like Goku hitting an enemy with the Spirit Bomb or Vegeta doing his Final Flash. The tag system in the game is….weird. This isn’t like a Marvel vs. Capcom or Dragon Ball FighterZ system, where each character had their own individual life bar. In this game, everyone shares a life bar so if you are playing as Cell and you swap in Boruto, the life bar doesn’t change. With this in mind, I’m baffled as to why this is a tag game. I mean, most (if not all) characters play the same. Some might have an occasional different move but they’re all pretty similar. The characters that are the most different are the few JoJo’s characters and Yami Yugi from Yu-Gi-Oh because they have stands (or in Yugi’s case a card monster) that does most of their attacks. There is a lot of side stuff you can do, optional missions, really customizing your character with passive abilities, playing online, and so on, but the game just never feels fun. It’s not as bad as I initially feared but that still doesn’t make it a good fighting game. 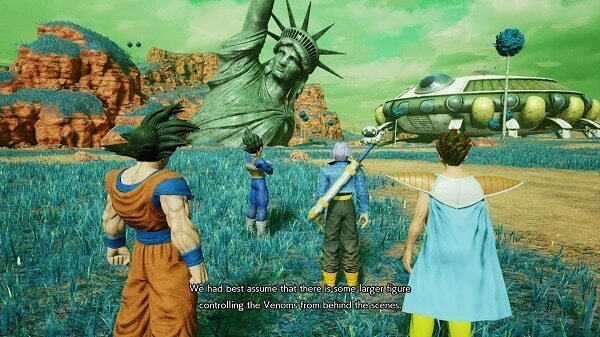 Side note: Why the hell is there a buried, Planet of the Apes-esque Stature of Liberty in the Namek fighting stage? I’ve watched all the Namek/Frieza sagas and I don’t remember seeing that around. While the battle system is actually decent, it’s just very boring. The real problem(s) with the game though is the insane hub-world, the story being asinine and most of the characters just kind of playing the same with only a few exceptions. If this game just had a normal menu system, I would have liked it so much more. But having to endlessly hunt down the next story beat was supremely annoying. This game was reviewed using a digital code provided by the publisher (Bandai Namco).